Vast Public Indifference: "That Worthy Vartuous & Most Jnieneuous Jenieal Woman"
"That Worthy Vartuous & Most Jnieneuous Jenieal Woman"
Of all the New England gravestone carvers, Obadiah Wheeler is my favorite. Maybe it's because I grew up just down the road from his home in Lebanon, CT, maybe it's the adorable soul effigies or the way he incorporates compass marks into his designs. I just love his work. Then again, perhaps it isn't so mysterious — I am captivated by vernacular language on gravestones and Mr. Wheeler was the king of creative spelling. His letter forms are so appealing — just look at that lower-case g! — his capitalization so unpredictable, and his word choice so delicious, how could you not enjoy his work? 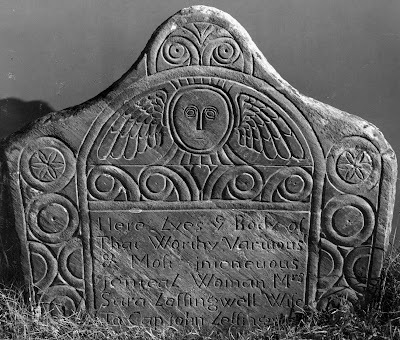 The Sara Laffingwell stone (1730) is a good example of what I love about Obadiah Wheeler's carving. Besides the simple-yet-solid lines of the feathers, the donut borders, and the central heart, there are those marvelous eyes! Is that God? A bird? A demon? Sara Laffingwell's soul? And why is it looking at me like that? Many Wheeler stones have the suggestions of eyes in the curlicues on either side of the heart, but only a few have the staring God-bird-demon-soul eyes. To Cap john Leffingwell . . .
At least, that's what I think it says. I've interpreted those words as "virtuous," "ingenious," and "genial." The man loved adjectives and was not afraid to take his best crack at spelling them. That's not a very scholarly take on Wheeler's carvings, but that's ok. Sometimes, it's nice to just enjoy these works viscerally.